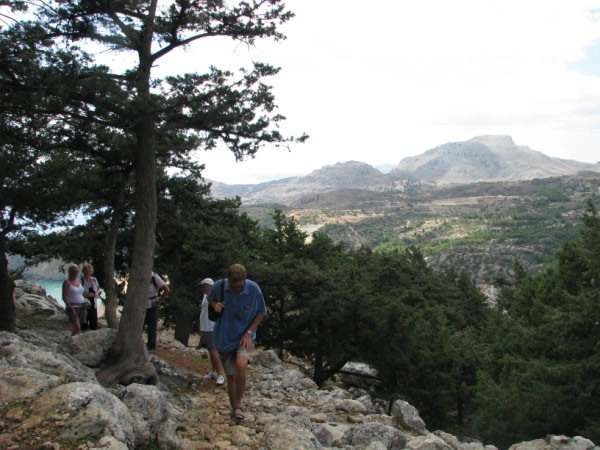 ﻿ Walking in Rhodes - Guide to Walking and Hiking in Rhodes in Greece. Rhodes is a wonderful island to explore and see the many sights and sounds of the island. If you have ever thought of exploring the island then you need to get as much information on your proposed walk or hiking route as possible. 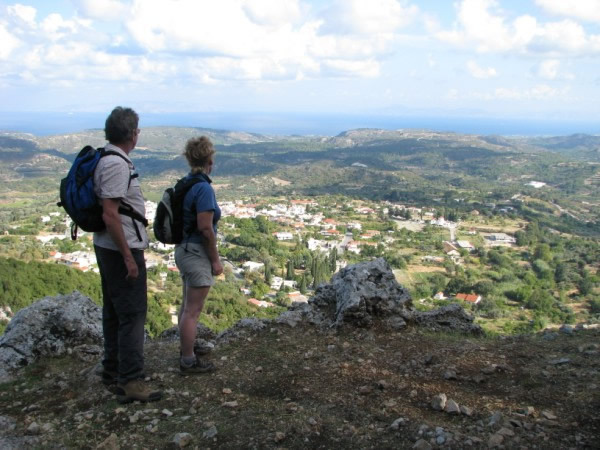 We recommend a company called Walking-Rhodes.com, this company has a team of well trained guides whose knowledge of the island is unsurpassed. The team of guides has a wealth of mountaineering, walking and guide experience so your in safe hands. If you have never tried guided walks then you are missing out, if you are a complete beginner then they have walks to suit your ability. 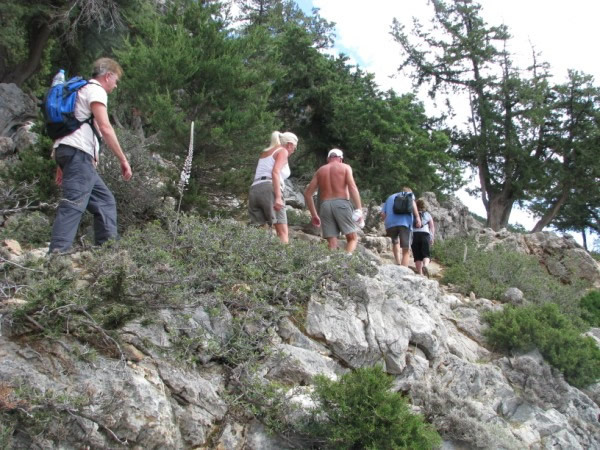 Most beginner routes are short and walked at a steady pace but if your more experienced there are many different graded routes to choose from and these go at a slightly quicker pace. There is something for everyone when it comes to walking in Rhodes, we have included some great photos and a new walk route for 2012 courtesy of Walking-Rhodes.com. Have a look through the walk and see what you think. If you want more information or want to book then visit Walking-Rhodes.com for more information. 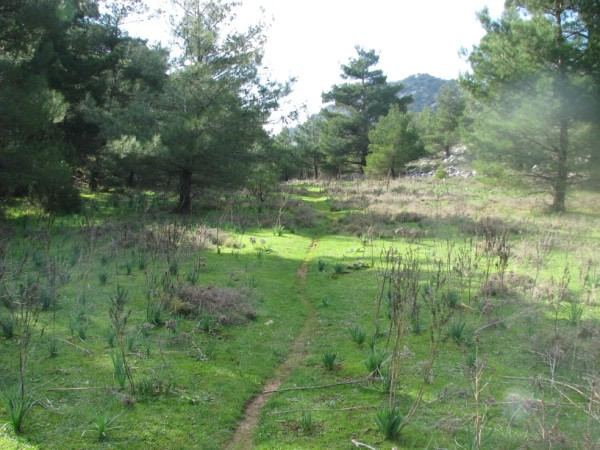 This walk takes you into the heart of Rhodes where you can see Greek farm practices and discover some real treats along the way on this linear walk through the Rhodian countryside. Before setting of, we make sure everyone has a hat, sunscreen and plenty of water. 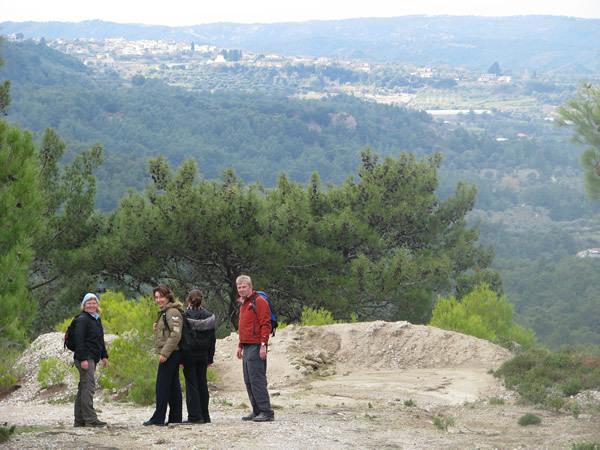 The walk begins with pleasant level walking on good tracks through orange orchards and olive groves; if you look closely, you might also spot fig, pomegranate and lemon trees. Along the way it is interesting to see old and new style of irrigation systems and often combinations of the two. Rhodes has an abundance of water, mostly in in large aquifers, making Rhodes quite green in comparison to some of the other Greek islands. Along the way we are likely to meet some local farmers and a shout of ‘Kaleemera’ (good morning) is well received with a smile and a wave. Steady walking brings us into a small village where we can top up with water and enjoy ambling along the narrow streets. 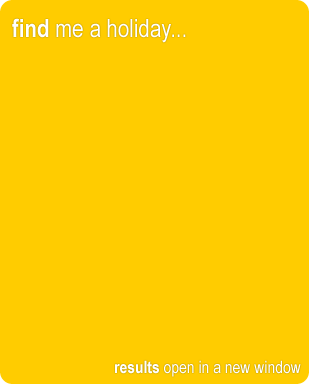 This is also a good chance to adjust boots and have a brief rest. A good track leads away from the village but eventually peters out until we find ourselves on goat tracks weaving between the wild herbs, rousing the aroma of the Mediterranean as we brush past and experience the wild areas of Rhodes. You are likely to see goats, most of which are wild and often there are lizards which seen basking in the sun. After a while we reach a dirt track that leads us to a wide dried up riverbed which is as much as five hundred meters wide and is the path to our lunch stop. We follow the riverbed ‘upstream’ to find what is perhaps the highlight of the walk, a deep and narrow slot canyon. This slot canyon, that many locals know nothing about has approximately fifty-metre high walls but is only a few meters wide. 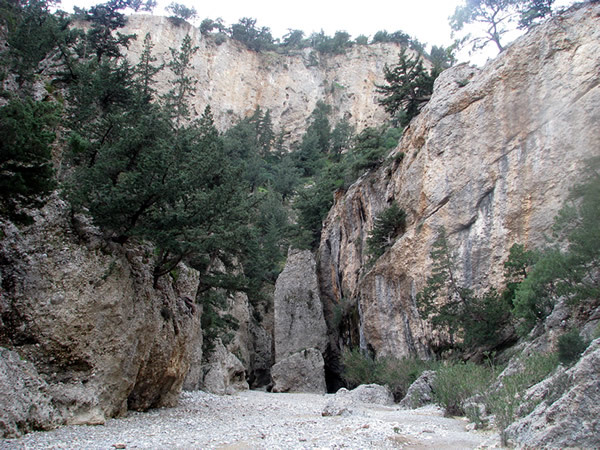 This is a spectacular hidden gem of Rhodes and certainly worth the walk. The stream that winds its way through the canyon and the shade from the cliffs makes this a green, beautiful and cool place to stop for a bite to eat. There is the chance you will see wild terrapins in the stream and you might notice the change in the vegetation that the surface waters creates. Returning down the other side of the riverbed after lunch, we head for a ridge line. Once over this our path drops down into a pleasant valley and a brief walk on the road (the first encountered since the village) before we take a turning onto a track that leads to a valley full of ancient olive trees. Previously we have found here the attractive and thankfully harmless ladybird spider; this has a bright red abdomen with black spots like those of a ladybird. Approaching the end of the walk now, we follow good tracks that lead us to a village and our end point. 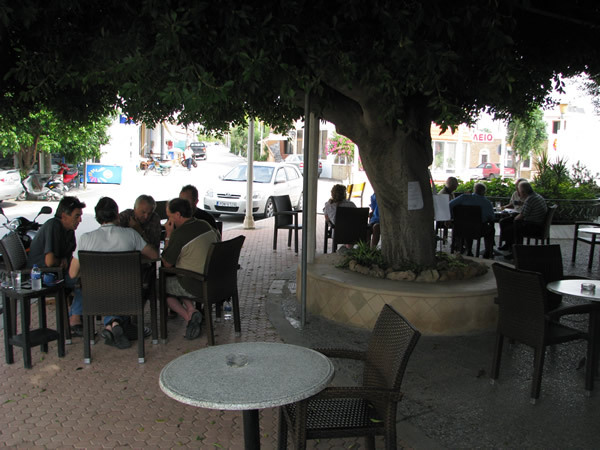 Here we have a good relationship with the Taverna owner and we can sit under the enormous shade tree with a cold drink and maybe a Greek salad while we await our lift. Find cheap holiday deals for Crete and Greece. Choose from a selection of top travel agents and book your dream holiday online.